Washington DC has pioneered the use of photo enforcement in the US, with a red light camera program started in 1999 and a speed camera program started in 2001, which are now operating at over 50 locations. (See Locations of DC Speed Cameras). Could the comparatively modest photo enforcement systems currently in Maryland evolve into something like the DC system, but on a statewide scale? The profit motive to try to do the same in Maryland is definitely there, both for the government and for the contractor. 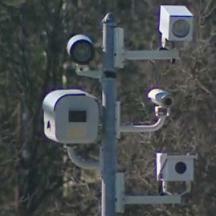 TheNewspaper.com reports that "Since 1999, Washington, D.C. red light and speed cameras have issued 3,296,175 tickets worth $250 million (as of 5/31/08)." In 2006, 64% of that revenue was reported to have come from Maryland residents, raising the question as to whether commuter routes used by MD residents who work in the district were being deliberately targeted. AAA Mid-Atlantic became particularly concerned about DC's camera enforcement after it discovered a letter that the DC Mayor sent to the Council Chair in 2005 asking the council to continue the city's automated traffic enforcement program. The letter said there was an "urgent need" to continue the program to collect revenue for the District." and made no mention of safety. An AAA spokesman said "It is a tremendous cash cow." AAA had previously referred to DC speed cameras as "an ever-increasing gantlet" for D.C. motorists. Unlike Maryland speed cameras, in DC cameras can be used legally on roads with any speed limit (even 55mph freeways), and are not required to give drivers any "margin for error" above the speed limit before issuing citations. The ability to appeal is also extremely restricted, as is your constitutional right to face your accuser. The deterrent value of mailing photo tickets is particularly suspect in DC, since so many visitors are from other parts of the county and would not receive citations until they have returned home. Were automated traffic enforcement the end of it, one might reasonably say that an exceptionally good driver who diligently obeys all traffic laws you could still travel to DC without undue harassment. Unfortunately that is no longer the case. DC police now set up random checkpoints for motorists in parts of the city to combat crime. Police are allowed to stop any car with no probable cause, and ask the driver to explain their reason for being there. Those unable or unwilling to provide a valid reason can be told they may not pass. (Your papers please?) Metro riders are no longer immune. Now Metro (which also operates in suburban Maryland and northern Virginia) is also conducting random searches of passengers bags, without probable cause or warrants . Apparently the 4th Amendment is just too outdated and inconvenient for our nation's capital and its suburbs. Maryland has a tendency to follow in DC's footsteps. Will this trend continue? Given the direction they are going let's hope not!